.280 Ackley Improved ammo began its career somewhat inauspiciously as the .280 Remington (for a while named the 7mm Remington Express to improve sales, which it did not). Parker Otto Ackley (1903-1989), better known as simply P.O. Ackley, was one of the most important gunsmiths and ammunition designers of the 20th century. He has been credited with almost 30 different wildcat and improved rounds during his career. 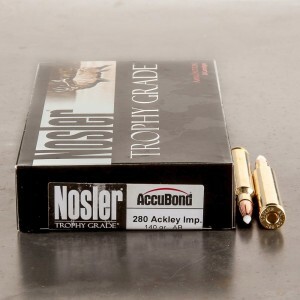 The .280 Ackley improved is one of them. Together with Fred Huntington, founder of RCBS, Ackley fiddled with the original .280 Remington and the .280 Ackley Improved was born. Great ammunition. Shoots fantastic groups out of my Kimber Mountain Ascent rifle. Ammunition to Go is a great place to buy ammunition. I made two recent purchases and they shipped immediately and they even called me to make sure there wasn't a credit card or identity theft because I made two purchases in two days with two separate credit cards with different billing address but same shipping address. That is a company paying attention! Great customer service when I called with a question too. I will definitely buy more ammo from ammo to go!